In heavy current and high voltage a.c. circuits, the measurement can not be done by using the method of extension of ranges of low range meter by providing suitable shunts. In such conditions, specially constructed accurate ratio transformers called instrument transformers. These can be used, irrespective of the voltage and current ratings of the a.c. circuits. These transformers not only extend the rang of the low range instrument but also isolate them from high current and high voltage a.c. circuits. This makes their handling very safe. 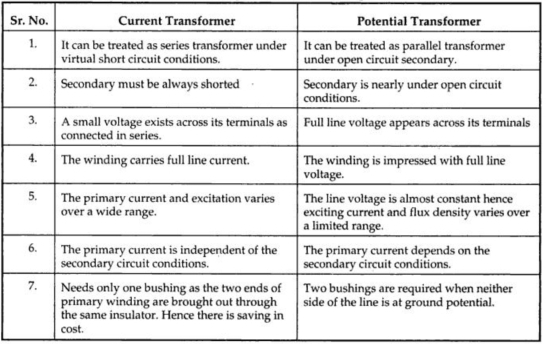 These are generally classified as (i) current transformers and (ii) potential transformers. 1.1 Comparison of C.T. and P.T. The actual transformation ratio is defined as the ratio of the magnitude of the actual primary phasor to the corresponding magnitude of actual secondary phasor. The actual ratio is also called transformation ratio. The nominal ratio is defined as the ratio of rated primary quantity to the rated secondary quantity, either current or voltage. It is the ratio of transformation i.e. actual ratio to the nominal ratio. The ratio which is indicated on the name plate of a transformer is always its nominal ratio. In practice it is said that current transformation ratio I2/I1 is equal to the turns ratio N1/N2. But actually it is not so. The current ratio is not equal to turns ratio because of magnetizing and core loss components of the exciting current. It also gets affected due to the secondary current and its power factor. The load current is not a constant fraction of the primary current. Similarly in case of potential transformers, the voltage ratio V2/V1 is also not exactly equal to V2/V1 due to the factors mentioned above. Thus the transformation ratio is not constant but depends on the load current, power factor of load and exciting current of the transformer. Due to this fact, large error is introduced in the measurements done by the instrument transformers. Such an error is called ratio error. In the power measurements, it is must that the phase of secondary current is to be displaced by exactly 180o from that of the primary current for C.T. While the phase of secondary voltage is to be displaced by exactly from that of the primary voltage, for P.T. But actually is is not so. The error introduced due to this fact is called phase angle error. It denoted by angle θ by which the phase difference between primary and secondary is different from 180o. Approximate results : In practice, the load are inductive and is positive and very small. Interms of Ip, these can be written using n = Ip/Is. The p.f. of the secondary circuit depends on the p.f. of the burden on secondary. This directly affects the two errors of the transformer. a. Ratio error : For all inductive loads,δ is positive hence sin(δ + α) is positive hence actual ratio R is always greater than the turns ratio n. Foe capacitive burdens, is negative and R is less than the turns ratio. b. Phase angle error : When load is inductive and is small positive then θ is positive. But as δ approaches 90o as load becomes highly inductive then θ becomes negative. For capacitive load, δ is negative and θ is always positive. The Ip and Is are directly related thus as Ip changes, Is also changes. For low values of Ip, Io is dominating thus Im and Ic are also dominating parts of Ip. Thus errors are higher. As Ip increases, part of Io becomes insignificant from Ip hence Ic and Im also are less significant compared to Ip i.e. Is. Thus errors are less. The secondary winding circuit burden increases means volt ampere rating increases. Due to increased current, secondary flux increases which induce more voltage on secondary. Thus both Im and Ic increases to keep flux constant. Due to this, errors also increases. Thus more secondary burden means more errors. If frequency is increased at constant voltage then the flux and flux density decreases. Thus there is reduction in Im and Ic hence errors also get reduced. Let us study the effect of various parameters on the characteristics of potential transformers. The p.f. of secondary circuit depends on the p.f. of the secondary burden. As p.f. decreases, angle Δ increases. This shifts Ip towards Io, as seen from the phasor diagram. Thus Vp and Vs becomes almost in phase with Ep and Es respectively. Thus Vp becomes more compared to Ep but as Vp in constant as supply voltage., the result is the reduction in Ep. Similarly the voltage Vs also reduces compared to Es. Hence from equation (11) it is clear that, R increases as Vs decreases due to decreases due to decrease in the p.f. of secondary circuit. While Vs advances in phase and Vp retards hence negative phase angle reduces as lagging p.f. of secondary decreases. The change in burden on secondary changes the secondary current and secondary VA. As the secondary current increases, primary current increases. This increases the voltage drops. For constant Vp, Vs decreases. This increases the transformation ratio R. Thus ratio error increases as the secondary current i.e. burden increases. Due to increased voltage drop, Vp advances while Vs retards in phase. Thus the phase angle between Vp and Vs increases and becomes more negative as the secondary current increases. If frequency is increased at constant voltage then the flux and flux density decreases. This reduces the values of Im, Ic and hence Io. This tends to reduce errors. But increase in frequency increase the leakage reactance increasing the voltage drops. This increases the ratio and ratio error. This effects are opposite to each other and the resultant effect depends on relative values of Io and the leakage reactance. While the phase angle increases due to increase in leakage reactance as well as decrease in Io. The primary voltage is practically constant and there is hardly any significant change it hence there is no significant change in the errors. 1. Choosing low reluctance core. 2. Using material of high permability. 3. Providing smaller magnetic paths to the flux. 4. Using large cross section of the core. 5. Keeping flux density in the core to low value. 6. Taking suitable precautions while designing the assembly and interleaving the core. The errors depends on the voltage drops which are inturn depend on the values of resistance and leakage reactance. The resistance can be reduced by increasing cross-section of conductors and decreasing the length of the mean turn. The leakage reactances depend on the leakage fluxes. Note : Thus mutual coupling between the windings must be high hence windings must be as close as possible. Similarly keeping flux density as high as practicable, the number of turns required are less hence leakage reactances get reduced. Thus on no load, actual ratio exceeds by some factor. The remedy for this is to reduce the primary turns or increasing the number of secondary turns. Thus for one particular value of load, the actual ratio can be made equal to nominal ratio. This reduces the ratio error over the entire range of the burden. This is called turns compensation. However, the turns compensation does not affect the phase angle θ. 1. The normal range voltmeter and ammeter can be used along with these transformers to measure high voltage and currents. 2. The rating of low range meter can be fixed irrespective of the value of high voltage or current to be measured. 3. These transformer isolate the measurement from high voltage and current circuits. This ensures safety of the operator and makes the handling of the equipments very easy and safe. 4. These can be used for operating many types of protecting devices such as relay or pilot lights. 5. Several instruments can be fed economically by single transformer. The only disadvantage of these instrument transformers is that they can be used only for a.c. circuits and not for d.c. circuits.